I once read the color red is good for picture taking because it makes you look less washed-out and helps make photos pop. After wearing red a few times on the blog (here, here, and here) I have to agree. Through the power of the Internet, I also learned that red is a strong color that conjures up a range of emotions from love to warfare. In some cultures the color red denotes purity, joy, celebration, prosperity, and good luck. The color is also associated with winners. According to MSNBC, "wearing red is consistently associated with a higher probability of winning." As far as wearing red, a little bit goes a long way; multiple shades of red and even pink or orange combined make for a cheerful palette; and red is a good attention grabbing color when you don't want to sink into the background. 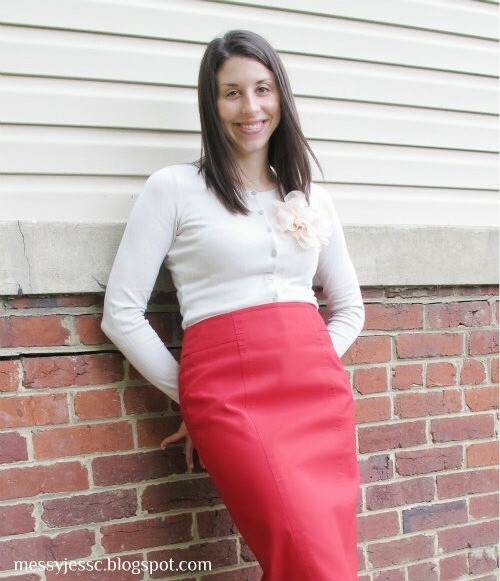 The reason behind me wearing red is much more simple - all of my other pencil skirts are at the drycleaner, but I'll be sure to tell people it's because I am a winner and am quite prosperous.